Rescue teams were searching for survivors after a seven-storey building collapsed in the Kenyan capital Nairobi on Friday due to flooding, the Red Cross said, with 44 people already pulled alive from the rubble. A spokesperson for the Kenya Red Cross could not confirm local media reports that at least three people were killed. "It is too early to speak about dead people, we don't have that information," said Arnolda Shiundu. "We don't know how many people are under the rubble, but we fear there are still several of them," she said. "We are still searching. A crane has arrived, ambulances are here." 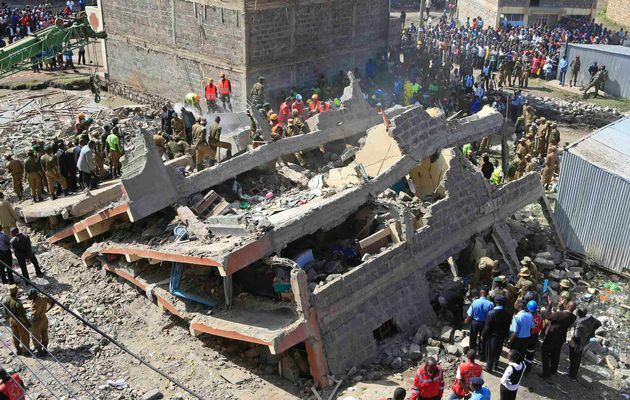 The seven-storey building in the densely-populated Huruma neighbourhood collapsed at around 21:30 (18:30 GMT) following the heaviest downpours since the start of the rainy season, Shiundu said. They have caused flooding and landslides in many areas of the city. "Up to now, 44 people have been rescued from the rubble," Shiundu said, without saying how many were injured. "Our teams are on the site, where it is complete chaos," she said. The Red Cross spokesperson had earlier mentioned at least 15 injured. Pictures broadcast by local media showed soldiers, policemen and civilians searching through the rubble of the collapsed buildings for survivors. Earlier on Friday, a wall around a property collapsed due to flooding in another part of the city, killing at least three people, according to local media. Nairobi has been in the middle of a building boom for some years but the quality of materials used and speed of construction have sometimes been called into question. The growing middle class has triggered an explosion in demand for housing and a rise in real estate prices in the east African capital.